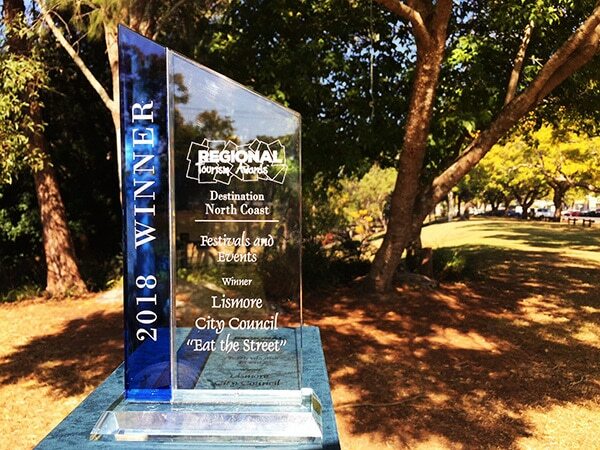 Lismore’s annual celebration of street food and signature event Eat the Street has won gold at the North Coast Regional Tourism Awards. The event was held on Wednesday night in Coffs Harbour and now puts Lismore in the running for the NSW State Tourism Awards. Lismore City Council Tourism and Events Manager Mitch Lowe dedicated the award to the event’s creator, City Centre Manager Jason Mumford, who sadly passed away recently. “Jason’s death has been very hard on the staff and we dedicate this award to his memory,” Mitch said. “Jason had a vision for Eat the Street and helped create what is now one of our most popular events for the city, enjoyed by more than 15,000 people each year. We are honoured to accept the award on his behalf. Lismore and Nimbin Visitor Information Centres were also inducted into the Hall of Fame for winning regional tourism awards in three consecutive years (2014, 2015, 2016). The NSW State Tourism Awards will be announced in Sydney this November.